Who doesn’t like free ? 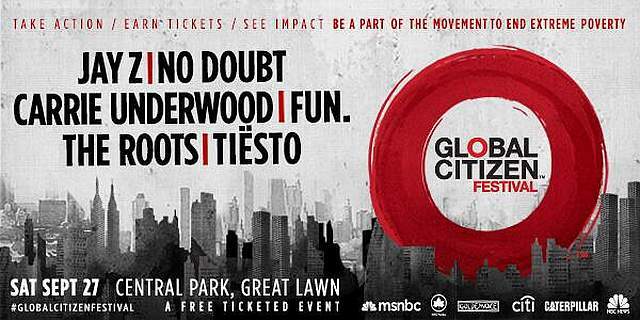 Global Citizen Festival is holding their third annual event September 27th in Central Park located in New York City, which will feature performances from big names such as Jay-Z and Gwen Stefani. The festival is designed to help fight against poverty around the world specifically towards children and young people, aiming to end the world crisis by 2030. Along with Jay-Z and Gwen Stefani who will also be performing with band mates No Doubt, Carrie Underwood, The Roots will also be performing. Last years line up included Stevie Wonder, Alicia Keys and John Mayer to name a few. Free tickets are available at the Global Citizen website, where users can sign petitions and email world leaders of their choice to help earn admission into the venue. A total of 48,000 free tickets will be giving out this year. VIP tickets are also available for purchase. For full details and to earn tickets follow the link below.